Marilyn at Delights of the Heart is celebrating America's birthday by hostessing Red, White, & Blue blogging days in Blogland. Today is the day to celebrate by posting photos that are predominately red in color. It sounded like fun, so I decided to look through my photo files from the past month and see what I had in red. I was amazed at how much RED there was to choose from. 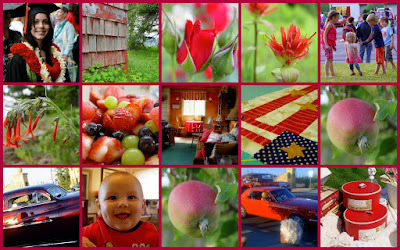 Flowers, cars, babies and children, strawberries, Sally's graduation, an old shingled cabin wall, new apples, an Americana quilt, and the decor of a quaint mountain cabin --- all in RED --- and each representing a memory from the month past! Won't you join Marilyn in CELEBRATING with RED today as well? As always, click on the collage for a larger view. It's so small the way it's posted! Beautiful collage! I love the little babes smile! !